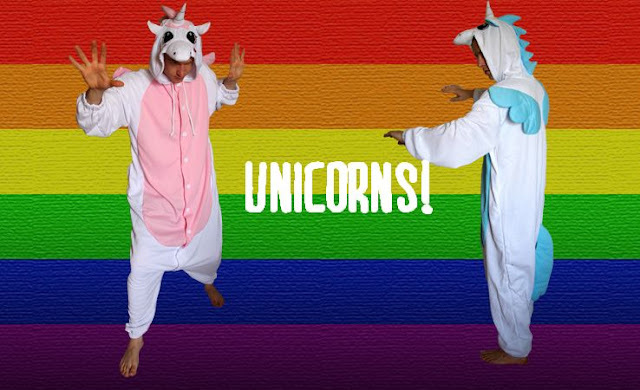 Our two unicorn kigurumi costumes have been out of stock since Christmas. So we're feeling pretty awesome and rainbow-tingly right now, as we're announcing that they are both most horn-tastically BACK. IN. STOCK. Oh yes, just when you thought the unicorn kigurumi costume was extinct, nothing but a mythical mirage from ancient folklore, a bizarre North Korean propaganda stunt, or perhaps just a donkey with a kitchen roll gaffa-taped to its forehead, along comes Animal Costumes Shop (yikes! that's us), utterly smashing it with not one but two of these magical horned horsey onesie suits. The unicorn kigurumi comes in two different colour schemes, there's the blue unicorn kigurumi and the pink unicorn kigurumi. (It's not a boy/girl thing, it's just a gender-neutral pink/blue thing, OK? Perhaps they're different breeds of unicorn, or they have different magical powers. Maybe the blue one's horn can turn water into lemonade, and the pink one turns mud into marshmallows... or something). What is more, each one comes in three different adult sizes, so in a way we have 6 unicorns! That's more unicorns than Legend, A Never Ending Story, Willow and Lord of the Rings combined. *smug face*. They're both available now, so enjoy being unicorns, Planet Earth, enjoy it.